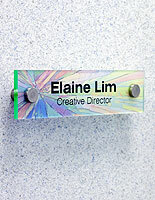 These Door Signs Present Personalized Messages in a Conference Room or Office! 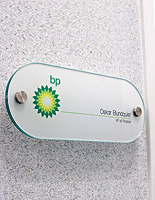 These Custom Name Plates Have an Oval Design with Acrylic Construction! These Door Signs Garner Interest! A complete, customizeable DIY signage kit! 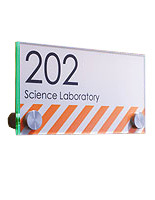 Acrylic panels have green edges and hold 5" x 8" horizontal or vertical orientation signs. 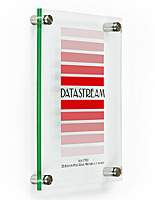 Stainless steel finish standoffs add modern style while mounting display. (3) sheets each of both frosted and clear print films included (for use with Photocopiers or Laser Printers only). Perfect for mounting on doors and walls in offices and other professional environments. These door signs come with lots of features for convenient use. 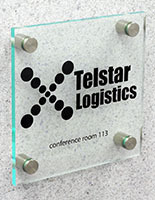 The lobby directory panels provide the look of glass, but are actually much stronger and less expensive. These door signs have an attractive acrylic construction with green edging, which accents the message and the rest of the decor. The name plates are a wonderful option for those advertisers on a budget, and offers lower price points for those individuals buying in bulk. 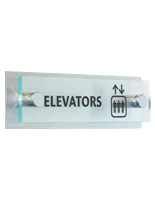 These wayfinding door signs include the clear and frosted films to coordinate best with the custom design. These door signs will present the personalized images with great detail no matter the film chosen. Supplemental sheets are included for alterations and updates later on. These door signs are easy to make when using the downloadable templates below. 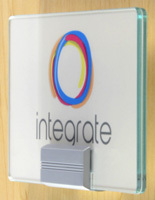 The lobby directory panels include the templates to quickly insert logos, graphics and messages. These door signs hold the images by sandwiching the panels together. Users mount the units to the wall with the included standoffs and the messages are secure. 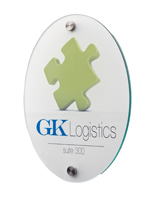 These door signs are manufactured out of high quality acrylic to stand up over long periods of use. 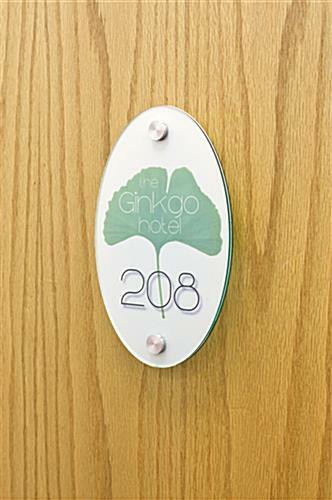 The office signage systems are commonly implemented when making name plates for rooms and areas in establishments, so guests can quickly find the appropriate place. 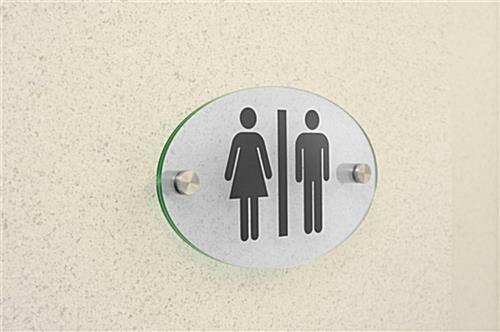 These door signs which have clear designs, sometimes called conference room displays, are very helpful within busy venues, such as educational facilities, government establishments, and office buildings. 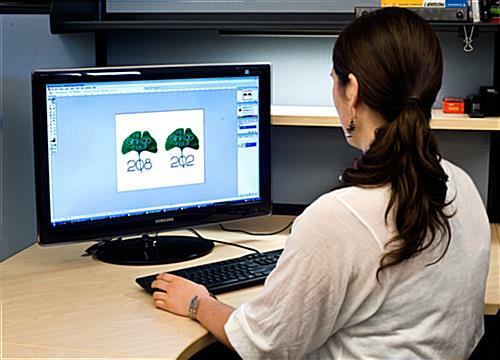 The personalized signage panels are perfect for users who want a DIY look because the content can be designed and printed from a home computer. 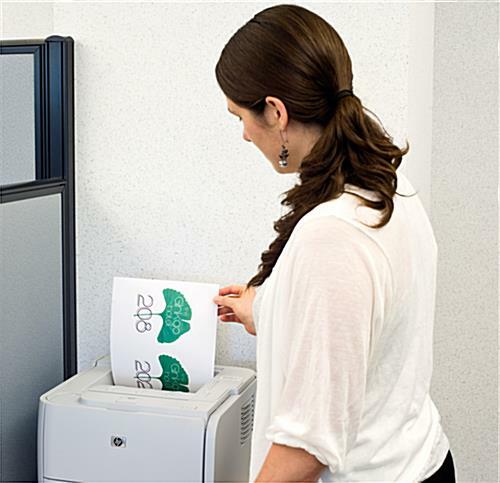 These door signs come with printable film sheets to better help customers print out images. The mounting hardware and standoffs are also included to make installation much more convenient. These door signs are commonly affixed to walls and other flat surfaces. Users can try out the fixtures in multiple places before making a decision.